I am John Smith, the Online Parish Clerk ("OPC") for Phillack and Hayle and more lately St Erth, with family history interests in these and other nearby parishes. To learn about Cornwall's Online Parish Clerk project, visit the OPC website. My objective with this website is to assist family historians and others with an interest in Phillack and/or Hayle with their research by bringing together genealogical and local historical information in a single place. Please feel free to contact me (see 'Contacting Me' below) if you cannot find the information you were looking for in these pages. I have more records that await transcription or cannot be published on the website but I am always happy to do look ups - all that is needed is a please and a thank you. The transcriptions in these pages results from the efforts of many people worldwide and thanks are due to them for allowing their work to be included here. Also, a reminder that many of the transcribed items on these pages have not been verified and no responsibility is accepted for errors or omissions. As with every resource, researchers are urged to refer to the original documentation to satisfy themselves as to the accuracy of the information. This website will continue to be a 'work in progress' as further transcriptions from the registers of churches in Phillack and Hayle are added over time and as newspaper extracts and other material that relate to people and/or events in Phillack or Hayle come to hand. About Phillack and Hayle - The parish of Phillack, originally located in the Hundred of Penwith, was bounded on the north by Gwithian, on the east by Gwinear, on the south by St. Erth, and on the west by St. Ives Bay and the River Hayle estuary - the latter separates it from Lelant. This is an area of sand dunes stretching from the mouth of the River Hayle at Riviere Towans, northwards to Godrevy Point. It was not mentioned in the Doomsday survey of 1086, but the area once appeared to include a Celtic monastery. Named from the Cornish heyl, 'estuary', the civil parish of Hayle was formally created from part of the now defunct civil parish of Phillack in 1888, later combined with the civil parish of Phillack in 1935 and in 1937 was incorporated as part of the civil parish of St. Erth. To learn more of the history of Phillack and Hayle, click here. To see an aerial view of modern day Hayle and the surrounding area, courtesy of Multimap.com, click here. To read Wikipedia's article on Phillack, click here. To read Wikipedia's article on Hayle, click here. To read an extract from Black's Guide to the Duchy of Cornwall, a travel guide published in 1879 on the town of Hayle, and reproduced here with the kind permission of Rosemary and Stan Rodcliffe, click here. Census – To see what census information for Phillack and Hayle is available and where to find it, click here. Churches and Church Registers - History of local churches and transcriptions from their registers. Note that OPC's have no role in the day to day activities of churches in their selected communities. To contact church officials from Phillack's Parish Church or St. Elwyn in Hayle, email the Godrevy Team Ministry Office in Hayle. The Godrevy Team Ministry provides the pastoral activities of the Parish Churches of Phillack (St. Felicitas), Gwithian, Gwinear, St. Erth and St. Elwyn Hayle. Phillack Parish Church (St Felicitas) - To see photos of this church and learn of the church's history, click here. To see transcriptions of baptisms, marriages and burials at this church now maintained at the Cornwall OPC website, click here. Copperhouse Wesleyan Methodist Chapel - To see photos of this chapel and chapel life, circa 1930, or transcriptions of baptisms for 1819-1837, click here. St. Elwyn Hayle - To see transcriptions of baptisms and marriages at this churchnow maintained at the Cornwall OPC website, click here. To see a recent 360º photograph of the interior of this church, courtesy of 'Panoramic Earth', click here. Hayle Wesleyan Circuit - With permission from Cornwall Legacy, limited lookups from the Hayle Wesleyan Circuit Register (from 1866 to 1900) and Hayle Wesleyan Circuit (Wall Section) Register (from 1862 to 1900) are available by contacting me. Contact Cornwall Legacy for all transcription details. 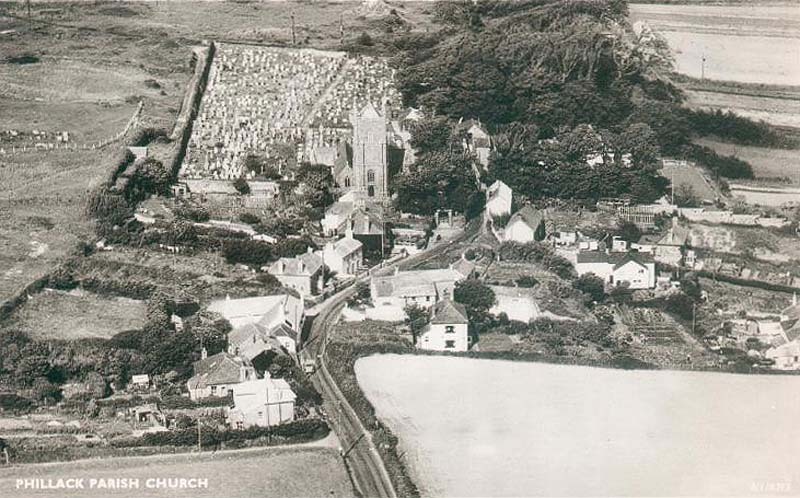 St. Erth Parish Church - As that part of Hayle known as Foundry straddled the border between the parishes of Phillack/Hayle and St. Erth, there were many baptisms, marriages and burials at the St. Erth Parish Church that related to residents of Phillack and Hayle. Click to see a list of St. Erth baptisms between 1813 and 1899 where the abode of a parent was Phillack or Hayle. Click to see a list of St. Erth marriages during the period 1701 to 1919 where the abode of the bride and/or groom was Phillack or Hayle. Click to see a list of St. Erth burials between 1701 and 1930 where the deceased's abode was Phillack or Hayle. History - A series of articles on aspects of the history of these two communities. Links - A collection of links to other websites that may be of interest. Maps – Click to view a collection of mostly old maps of the area. To see a current map of the area, please go to Multimap.com. You can choose the area in which you would like to search and enlarge the map to very fine detail. Aerial views of the areas are options offered by Multimap. • Extracts from 1920 catalogue for sale of "Agricultural and Other Properties", some located in Phillack East. Photographs – Here are two photos provided by Jim Davey and reproduced with his kind permission. One photo was taken at a street party held at Trelawney Place Hayle, on VJ Day when World War II ended in 1945. There are many local characters here - do you recognise anyone? The second photo is of the chapel at Hayle Foundry, possibly taken in the 1920s or 1930s. Note: use your browser's back button to return to this page. To view the Francis Frith collection of photographs of Hayle taken from the late 1800s to the mid 1900s, click here. To view the collection of photographs of Phillack from the same time-frame, click here. To see a series of aerial photos of Hayle and environs taken circa 1930 form the series 'Britain from Above' held by English Heritage, click here and type Hayle into the dialog box. This aerial photo of Phillack Parish Church, reproduced with the kind permission of Phil Evans, webmaster of www.oldukphotos.com, provides a perspective of the church, graveyard and the surrounding area. 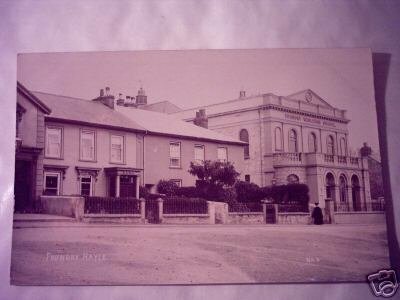 To view a selection of modern day photos of Phillack and Hayle, taken by Charles Winpenny, that are reproduced here with his kind permission, click here. More modern day photographs of Phillack and Hayle and the surrounding area can be found at the Geograph and at the Cornwall Guide websites. Note: use your browser's back button to return to this page. 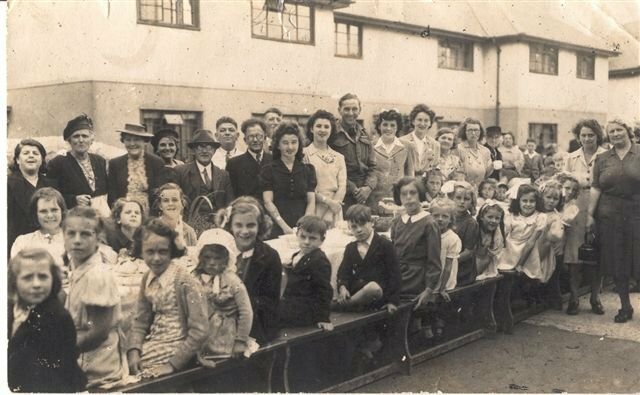 To view a collection of photographs of events, people and scenes in the Hayle Community Archive, click here. Postcard Images - Images of Phillack and Hayle in the early 1900s from Julie Wheeler's collection of postcards and reproduced with her kind permission. Click here. Researchers’ Interests – Are there others also researching family interests similar to yours? To see a list of researchers with family interests in Phillack and/or Hayle. Click here. If you would like to add your Phillack and/or Hayle interests to this list, please contact me (see below). Strays - Strays are usually those born in one parish or community and later found elsewhere, often in a census record. A list of strays born/baptised in Phillack or Hayle and found elsewhere in England or Wales in the 1851 or a subsequent census will be available later. Wills and Letters of Administration ("Admons") - To see an index of wills and admons for Phillack residents during the period 1660 to 1768 as compiled by Kathie Weigel, click here. For Kathie's supplementary index, click here then scroll down to the entries for Phillack. To see Kathie's abstracts of wills and admons at her Cornish Genealogy Database, click here. Please note that I have no information on wills or probates and suggest that researchers visit the Probate Records page at the Genuki Cornwall website for guidance. Rick Rescorla, who was born in 1939 at Hayle and grew up there, enabled thousands to escape from New York's World Trade Centre on that fateful day. To learn more of this Cornish and American hero, click here. in 2011, a cousin of Rick Rescorla, the Cornish born hero of the the 2001 attack on the New York World Trade Centre recalls events of that fateful day 10 years earlier. To read this article in Cornwall's "Western Morning News" published on 6 Sep 2011, click here. Contacting Me - To email me, click here. If expecting a reply, please make sure your email program and/or your ISP will accept messages from my email address. All transcriptions have been carried out by volunteers and many items have not been verified and no responsibility is accepted for errors or omissions. As with every resource, researchers are urged to refer to the original documentation to verify the information. Copyright © 2005-2015 John Smith. All material is copyright and/or reproduced with permission. Use is restricted to individuals conducting historical and/or family history research.